Thank you for your help, Teinaava. I've modified The Elder Stats to work with these new factions. 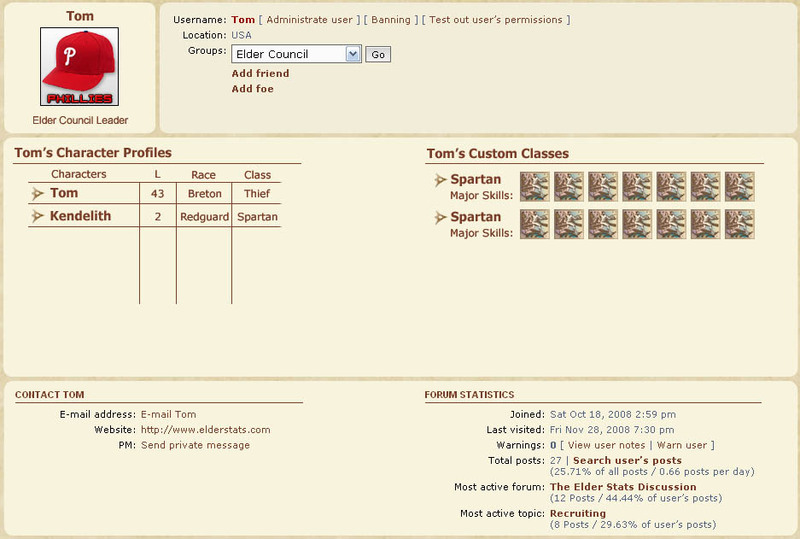 Now, are there any other important things besides weapons and armor that are added to Oblivion with those two expansion packs, or are the new factions the only new additions of importance to The Elder Stats project? Tom wrote: Now, are there any other important things besides weapons and armor that are added to Oblivion with those two expansion packs, or are the new factions the only new additions of importance to The Elder Stats project? The Shivering Isles adds a "Shivering Isles Bounty" which is seperate from your bounty in Cyrodiil. So, if you have a place where you enter your bounty in Cyrodiil, you should add a place for your Shivering Isles bounty. Xavier, it looks great ! I really like it! I can't believe ES is finished soon! I did as you said. Thank you for that information. All of these additions to the ES website are going to make it appeal to Oblivion fans of all kinds, and that is a very good thing! By the way, not to promise anything, but you may be able to expect at least a beta release of The Elder Stats website before the new year. Tom and Xavier, i would like to Commend your work with the Website, as what i've heard from the Dev. Blog It will be truly amazing. Keep up the good work. Looking forward to that late January Opening. Will you have some sort of add-on that puts some stats of our character in the panel to the right? The one with our avatar and posts. Kestral wrote: Will you have some sort of add-on that puts some stats of our character in the panel to the right? Well, I was thinking about doing that, but then I thought of a few reasons why it wouldn't be a very good idea. One of the reasons is that some members will have multiple characters, so it would require showing individual stats for each of their characters in the side bar under their avatars. Also, I personally believe that putting stats on the sidebar would end up making each post box a bit too long in height, thus creating a lot of "white space" at the bottom of each post box and making the page a bit more tedious to read through for viewers with lower monitor resolutions. And, by the way, if you click on a member's profile, you will be able to see each character that they have created listed in their profile with a few stats next to them, accompanied by a link to each character's profile, so I think that is sufficient enough for now. (I don't know if you've seen the beta member profile design, but you can view it here. It gives you the feel of what I just explained about each member's profile.) However, I could put one stat on the right sidebar that says something like "Number of Characters." That might be a more feasible stat to place on the sidebar for each member. It's not a bad idea. Yeah, that could be a good idea. I hope newcomers know that they can click people's usernames to view their profiles. But, it shouldn't be to much of a problem.